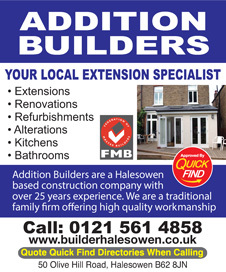 Addition Builders in Halesowen are a well established building company, operating locally for the past 23 years. Addition Builders are Quick Find Directories recommended, proud members of the Federation of Master Builders, Gas Safe registered, NICEIC Domestic Installers and carry the Trustmark seal of approval; so you can rest assured you will receive a professional service. Covering Halesowen, Stourbridge, Cradley Heath, Pedmore Fields, Hasbury and surrounding areas. "Graham built a garden room at the back of our renovated bungalow, creating a beautiful kitchen/diner with sunny sitting area. He planned exactly what we wanted and stuck to his original estimated time scale and price. We particularly liked the fact that we had his full attention during the project, he doesn't keep disappearing to work elsewhere! Graham is pleasant and polite and tries not to impose too much on his clients' 'space'. He seems to have a good relationship with local building inspectors, which I'm sure is a result of his excellent and professional work. I took up 3 references from previous jobs - all very happy customers. We have had lots of compliments about the standard of his brickwork and attention to detail, in fact other craftsmen involved in our renovation requested his contact details. We would have no hesitation in recommending Addition Builders and would be happy to show off his handiwork to potential customers. Thank you Graham and Julie from two very happy clients." "I used Graham and Additions back in 2004 when in a previous marriage, to build a rear extension and kitchen. The work was amazing and Graham even went to the lengths of making the brickwork decorative , along the edges, which was not planned but very much appreciated. Another aspect I liked was that Graham did not do many clients at once, but in fact gave my project , his full attention from the first to last day. That was priceless. At my current home, I am looking to make alterations in the near future and Graham will be hopefully the person to do it, pending an agreeable price."